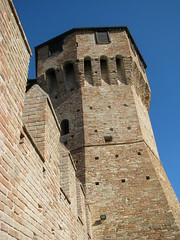 The stronghold of Gradara is located at the border between the Marche and Romagna regions. Its geographical location has fostered its development as the fortress is situated on a hill 142 meters above sea level in a dominant position and in a strategic location for communication and road network since ancient times. 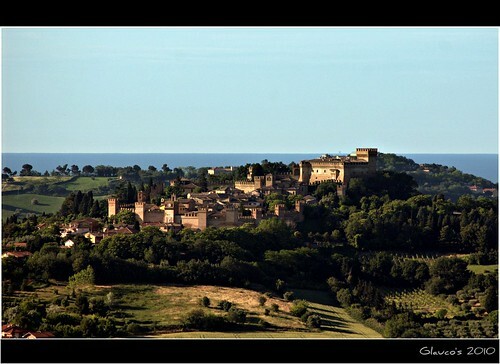 Gradara is located a few kilometres far from the Adriatic road, 25 kilometres far from Rimini and 13 far from Pesaro. It is a fortified medieval village. 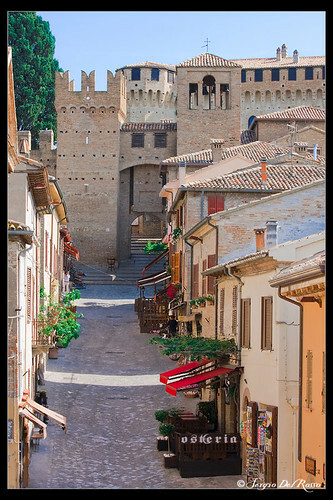 This is one of the best preserved examples of medieval town in Italy. The 2 city walls rings are still intact and one of them extends for almost 800 meters and the main tower is about 30 meters high, creating an imposing and almost intimidating building, visible from afar. 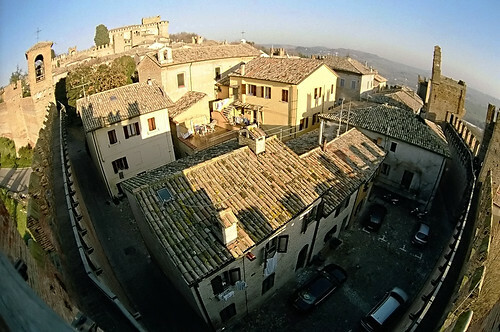 Gradara received numerous awards for its uniqueness, such as: “Capital of the Middle Ages”, Orange Flag, an eco-tourism and environment award of the Italian Touring Club and it has been rated among the most beautiful villages in Italy. Entering the town through one of the city gates, you are faced with narrow streets and medieval buildings. A blast from the past, as it often happens in Italy, where time has not changed in a decisive way the environment. The Rock of Gradara is undoubtedly the most important building. This was built in the twelfth century by the Malatesta family. Inside you can visit several rooms, including that of Paolo and Francesca. The story of Paolo and Francesca is well known thanks to Dante Alighieri who dedicated the fifth Canto of the Inferno of Divine Comedy to this unlucky love. Tradition says that in 1289 the love between Paolo and Francesca was born in one of these rooms, and here it saw its end in a tragic death. Inside the fortress there is a small chapel where is kept a precious ceramic altarpiece by Luca della Robbia. Taking a walk along the well preserved walls offers the opportunity to admire a splendid panorama. The Historical Museum is very interesting. This collects medieval weapons, torture instruments and typical objects of traditional rural life. Even the Garden of Olives in Via Cappuccini has its peculiarity: it houses olive trees so old that the RNC is looking to identify the source. Urbino: 5 places to visit.